Pastels are the new neutrals… spring into pastels with Annie Sloan and Meldon House. Get Craqueleuring, it's almost the end of January! Meldon House & Home hosted our very successful first chalk paint® technique workshop this week, held at our Limpsfield neighbours, Avalanche Gallery. Time 2 book our decorative paint workshops - this autumn to be held at The Old Rectory, Bletchingley. Summer hols over - it's time to get creative! The summer holidays are finally over and it’s back to school / work / routine - so soon?! Where did the summer go? We’ve spent it settling into our new space, meeting new friends and searching for the perfect space for our furniture… but now it’s time to get creative! Autumn is a great time to get creative and start those up-cycling and creative painting projects you’ve been putting off. We’ve got everythign you need in the way of Annie Sloan Chalk Paint, tools and technique advice, so come and see us in the Limpsfield shop for paint and advice. We also undertake furniture restoration and painting commissions if you feel that your project is a bit beyond your capabilities or just don’t have the time. Bring a pic of your furniture piece to the shop and tell us your ideas. 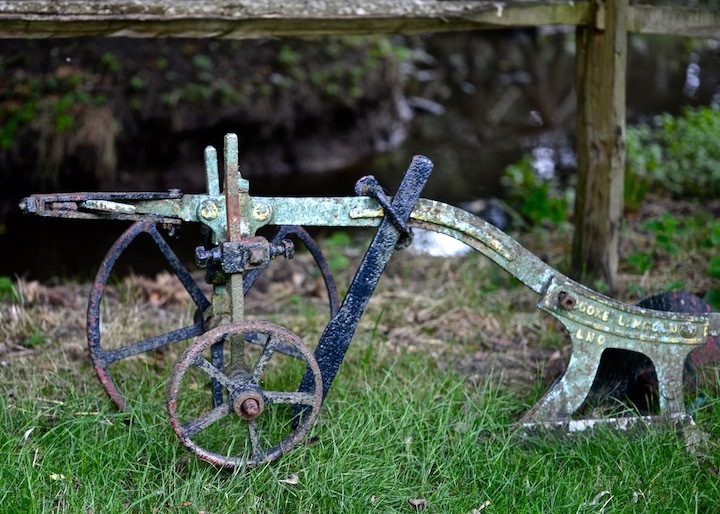 We go to all the major fairs and have a lot of contacts in vintage furniture, homewares and quirky pieces like this fabulous plough pictured above (now sold)! So if we don't have what you want right now, let us know what you're after and we'll happily go a-hunting. Call us, email or come and see us in the Limpsfield shop soon! Summer’s here. It’s time to make the most of it and style out your garden with these fabulous finds at Meldon House & Home. Time for a little holiday inspiration! Conjure up Provence, the Greek Islands or your favourite holiday destination in your home, all year round, with Anne Sloan chalk paint®, available at our Limpsfield shop. Breathe new life into old garden furniture with Annie Sloan Chalk Paint - all colours available in the Limpsfield store. Come and see us to find out how you can bring your garden alive this summer. We’ve finally moved into our beautiful new shop on Limpsfield High Street and we’re so happy to be here! Official opening day is tomorrow, Saturday 23rd June. Please pop along and say hello. Opening hours will be Tuesday to Saturday, 10am – 4pm. We'll see you in Limpsfield in a couple of weeks! We've now officially moved out of our shop in Oxted and will be in the new shop in Limpsfield High Street in two weeks' time. While we get the new space ready, Annie Sloan Chalk Paint® and accessories will be available as always - just call 07500059427 and tell us what you need. Meldon House is moving home! Meldon House is moving home! Our moving sale starts Saturday 28 April 2018. Come and see what fabulous things we have in store and we’ll tell you all about our exciting plans!